Read my five-plus-starred review of Reckless Behavior. Add Reckless Behavior on Goodreads. I turned, and to my horror, Ben and Casey were getting out of their rental car, probably to inspect the damage the other car had done. Some employees and bystanders hurried out the door, no doubt to see what was happening and maybe to help. In the commotion, someone bumped into me, and I stumbled. Then a foot swept my good leg out from under me, and I toppled, landing hard enough to send pain shooting through my bad ankle. “Andreas!” Lisa grabbed my arm, but then she was knocked aside too. 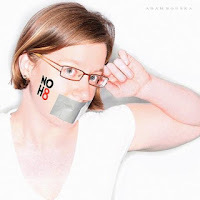 “Drop the gun!” Darren shouted in the distance. I scrambled, trying to get to my feet. I reached for a crutch, but my pistol was already in my hand. I didn’t even remember taking it out. A bullet ricocheted off something. Someone shouted. Lisa darted back into the restaurant. More gunfire. Shouts. A car peeling out. An engine vanishing into the night. And then . . . nothing. Panicked shouts and murmurs, but otherwise, silence. Someone helped me to my feet and gave me back my crutches. I looked up to see Darren and Ben coming across the parking lot. Ben was limping pretty hard, one arm tucked protectively against his side, the other slung over Darren’s shoulders. “Three guys,” Ben said. “They clipped the car, then came at me and Casey and—” His voice wavered. Reality started sinking in. Ben was hurt. God knew how close Darren had come to an injury or worse. I sank onto the bench. Twenty-plus years of cop instincts disappeared in a heartbeat, replaced by nothing but pure, bone-deep panic. I was trained for this. Enough that I could be calm to the point of near apathy in a crisis. I wasn’t calm this time. I was closer to catatonic. I couldn’t move. Think. Breathe. Act. Just . . . gone. And I had no idea what to do. It’s “hell no” at first sight for newly partnered detectives Andreas Ruffner and Darren Corliss. Darren is too chipper, Andreas is too gruff, and that whole “IA wants me to prove you’re a dirty cop” thing really doesn’t get them off on the right foot. It doesn’t matter if they like each other. They’re partners and that’s final. Though Andreas is easy on the eyes. And Darren is kind of cute. And . . . okay, maybe they can make this work. They’d better, because as their cases get more horrifying—and more personal—they’ll have to trust each other with their lives, and with their hearts. 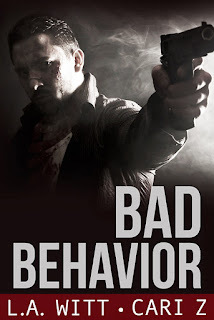 Learn more about the Bad Behavior series on Riptide Publishing. 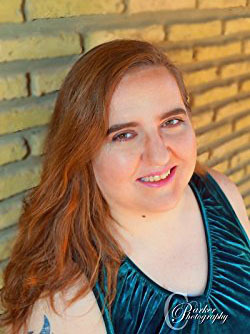 Cari has published short stories, novellas and novels with numerous print and e-presses, and she also offers up a tremendous amount of free content on Literotica.com, under the name Carizabeth. Follow her blog to read her serial stories, with new chapters posting every week. To celebrate the release of Reckless Behavior, one lucky winner will receive a $10 Riptide credit and their choice in an ebook from each of Cari and L.A.’s backlist! Leave a comment with your contact info to enter the contest. Entries close at midnight, Eastern time, on January 6, 2018. Contest is NOT restricted to U.S. entries. Thanks for following the tour, and don’t forget to leave your contact info! 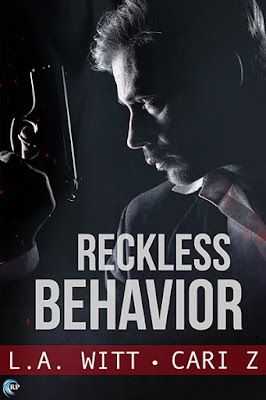 Follow the Reckless Behavior blog tour. Thanks for the review and excerpt! The series sounds amazing and I'm very excited about reading it!